In SmartThings, I go to Automation, SmartApps, and then CoRE. This website is for webCoRE … not CoRE. Both programs are by @ady624, but webCoRE is much more powerful. The two programs can both be installed at the same time without issue, but once you delve into webCoRE, you will likely not look back. You might be able to get Alexa working with CoRE, but as I do not use that program anymore, I wouldn’t be able to help much… My experience with CoRE is very limited because I switched over to webCoRE shortly afterwards. So you have Tasker installed on all of the phones in your home? I bought Tasker once, and it lets me install it on any device I own. But for the sake of this document, it is only required for the one device left at home connected to your speaker. I went back and removed the smartapp and reinstalled WebCoRE from scratch. This time, I did it correctly. 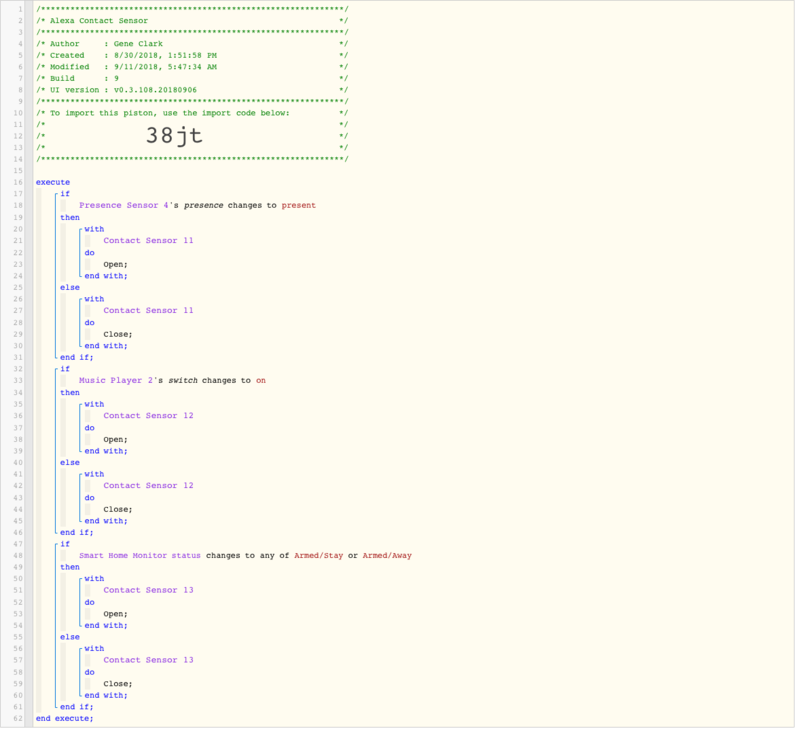 I was able to register my WebCoRE dashboard, which I couldn’t do before. I created my one line Push Notification piston and each time I press test, the notification appears, which is great! But Tasker still did not say or do anything. I have given up on Tasker as I realized that my Samsung R1 speaker can be used in WebCoRE to give voice prompts and other things, so I am going to use that instead of Tasker. Thanks for all of your responses and feedback!!! If you can live without those features, then sending a direct command is likely best. I spent a few hours yesterday bringing about 50 of my Spotify playlists into webCoRE. Now, I can trigger any of them at any time thanks to webCoRE! As an added bonus, I have found a great workaround to the old shuffle issue. This means if you play this playlist a few times, you will quickly get tired of track #1. In the past, I would start a playlist, and then immediately skip to the next track, but I have come up with a better (hands-free) solution. We can put a really short and silent track in the #1 position. This way, you will never hear it, and when it shuffles a few seconds later, it will always be to a different track. Now, when Alexa hears, “shuffle David Grisman playlist”, you will always get fresh songs right from the start! It is a shame Spotify cannot shuffle right off the bat, but this workaround works very well in the meantime. The shortest silent track I could find is 11 seconds long. Where do you adjust the volume? I can change the volume on my phone or on my Speaker. Normally, I tend to keep this old Android device at full volume, and just change the volumes on my external speakers. You may need to edit the Task in Tasker. Specifically, edit the “Say” command. Notice under “Stream” you have 6 choices. (Call, System, Ringer, Media, Alarm, Notification) I believe you can choose any of them, but keep in mind on Android, they each have a separate volume control. Your particular phone may not have all 6 volume controls, so you might want to check your phone’s capabilities before tweaking that line in Tasker. With the new integration between Alexa and sensors there’s so many more possibilities for notifications. 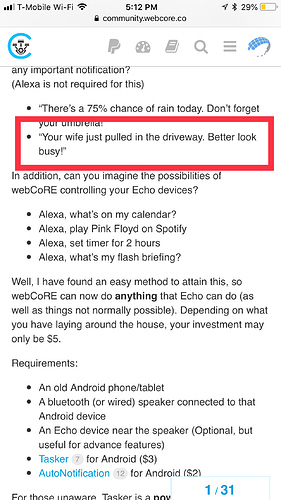 I’ve got an Alexa routine that announces when people are home based on webCoRE presence sensors. 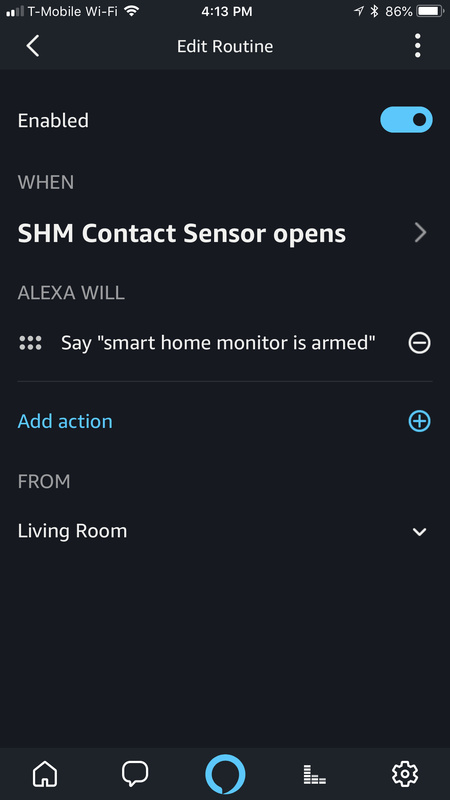 Tied the presence sensors to simulated contact sensors so present equals open and in Alexa I’ve got routine so if Contact Sensor changes to open then announce “[person’s name] is home”. Did they improve her capabilities beyond this? “The time is 4:00 P.M. It’s 79 degrees and Partly Cloudy outdoors. This is why I created this page as a workaround. I want my speaker to announce more than a predetermined sentence. As far as temperatures go - you can query multi sensors for the temperature. Ahh ok, thanks for clarifying. I tried to give simple examples in this thread, but in real life, my voice announcements are fairly robust. I have over 50 complex phrases that are spoken outloud (in a thousand different ways if we count the variables). I will continue to use my webCoRE to Tasker method until Alexa no longer has that limitation. The time is 4:00 P.M . It’s 79 degrees and Partly Cloudy outdoors. Tonight’s low is 50 degrees. It is a comfortable 73 degrees inside. would require over one billion SimSwitches to cover all possible announcements!!! So I want to make sure I am understanding how this works … you MUST have the always powered android device AND the connected speaker to get the Android device to make the initial announcement or request to the Echo, right? What’s the point of the Echo then? I have 4 Echos throughout my home. I’d like to have a piston that has all of them make the same push announcement, so no matter where I am in the house, I will hear it. Is this possible with this setup? Better yet, is there a way to push the announcement directly to the Echo’s from the piston and eliminate the intermediary devices? All ‘®’ notifications will be piped thru the Android and that connected speaker. This method requires two speakers. One regular speaker to ‘speak’ (like just mentioned) and an Echo speaker nearby to ‘listen’ to the command and act upon it. If you are using the two speaker setup mentioned above, you can use this method for that. Send PUSH notification "® Alexa, broadcast 'The time is '$time'. 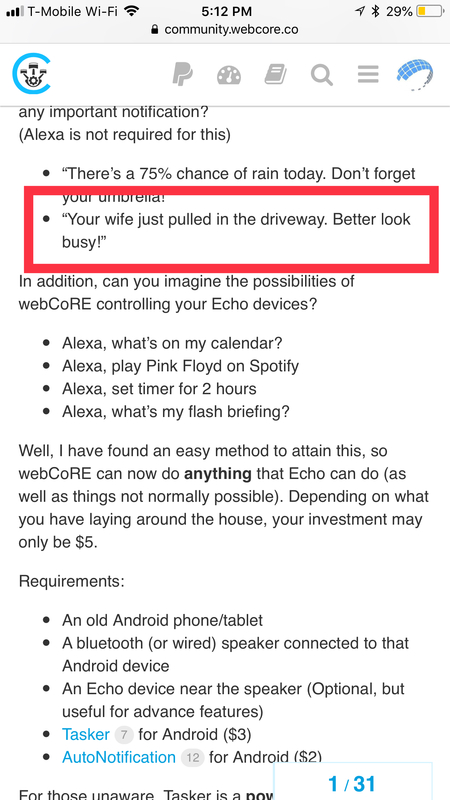 The weather is 'currentWeather' and there is a 'rainChance'% chance of rain today'"
Adding the word ‘broadcast’ after Alexa will push that entire phrase (with variables) to ALL of your Echo devices. Also, using the ‘broadcast’ makes a tiny chime before it is spoken out loud on the Echos, which is kind of nice. is there a way to push the announcement directly to the Echo’s from the piston and eliminate the intermediary devices? Unfortunately, Amazon has not opened up their API in that way. (which is why I created this workaround) Even if they do open it up in the future, you can bet there will be lots of limitations. My methods described in my first post here have ZERO limitations. Any and all commands & skills will work just as if you had spoken the command yourself. It’s tempting to try it … buy a Dot and put it somewhere out of the way in the house so the command isn’t annoying. I don’t have an extra android device right now but I imagine that wouldn’t be hard to find on ebay etc. Just curious, why do you need the external speaker to speak the command to the Echo? Isn’t the phone speaker loud enough? I thought about installing mine in a closet, but then I realized that many times, I only wanted the spoken announcement (or Alexa Skill) going to one device, so I changed my direction. Send PUSH notification "® Alexa, play Santana on Spotify"
Send PUSH notification "® Alexa, broadcast play Santana on Spotify"
If you place your Echo in a closet, you are limiting yourself to ONLY using the ‘broadcast’ features. why do you need the external speaker to speak the command to the Echo? Isn’t the phone speaker loud enough? 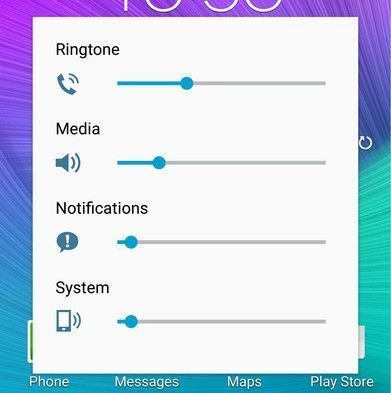 If your phone’s speakers are decent and kept close at high volume, it might not be needed. Although a $20 set of computer speakers would be better than that in my opinion. And, for what it’s worth, I helped a friend set this up and he decided to use his one and only cell phone instead of an additional Android. When he is out of the house, his cell will only speak URGENT alerts. When he is home, they are ALL spoken. We moved his phone’s charging cable right next to his Echo, so he just plugs it in when he gets home like normal. What announcements are you looking to make? I’ve got my Echo devices making several of them now that sensors are included in routines in Alexa. You’ll need to get creative and use lots of virtual devices, but it can be done. Don’t need external DLNA speakers or multiple Echo devices - just webCoRE and Alexa. Here’s a sample of what I’ve got going on. I’m using simulated contact sensors and pistons saying if SHM is armed then open simulated contact sensor and if disarmed close it. 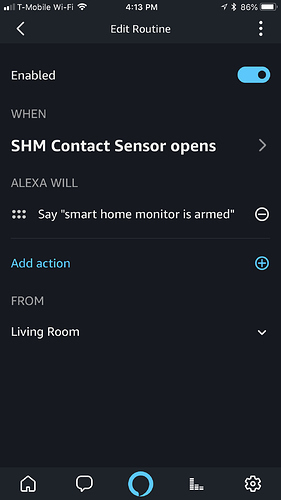 Then in Alexa I’ve got a routine that says if said contact sensor opens then she will announce “SHM is armed” and if it closes then she announces “SHM is disarmed”. You can do this with anything from presence sensors to switches, etc. I’ve even got welcome home messages setup. Next I’m going to use the smart weather tile for creating verbal weather announcements for when it snows. Or, you follow the suggestions on this page and add a single character to get as complex as you want. Basically, my method requires a half hour to set it up, but NO time for any future additions. Your method requires ST SimDevice to be created, webCoRE has to be told to connect to the new device, webCoRE programming has to be done to flip the new switch, Alexa discovery must be run, and Alexa Routine has to be programmed. All 5 of those steps have to be done for each and every phrase you want spoken. 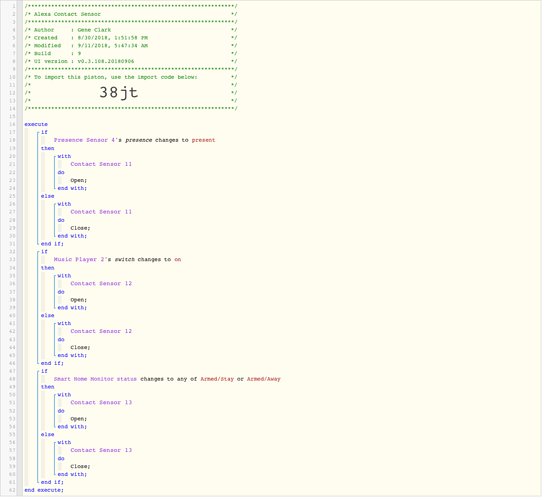 All methods are feasible, but this page is focusing on infinite advanced announcements with one character added in webCoRE. Please do not take offense to this rebuttal. If I only had a half dozen phrases that never changed, I may have done the same as you. And for clarification, this thread does NOT require a DLNA speaker. (a speaker from 1980 would work perfectly)… You do NOT need an Echo to hear the customized announcements… The exception is, if you want to send a command to an Echo, then you will need ONE Echo nearby.